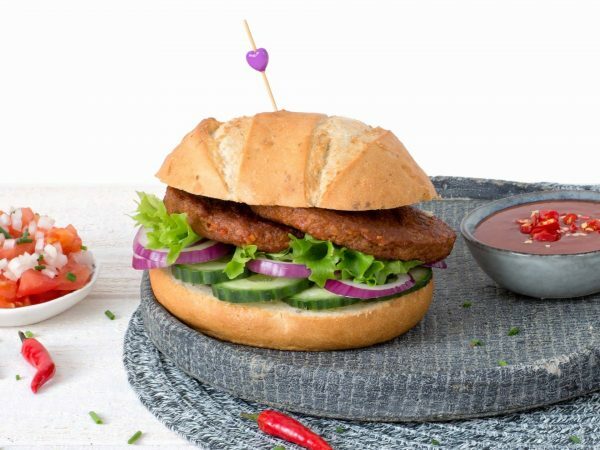 A vegetarian hamburger marinated in a spicy peri peri sauce. This makes the product ideal for the barbecue. This vegetarian piri piri hamburger can of course also be prepared in a frying pan. Water, vegetable proteins 17% (soy, wheat gluten), palm fat, Peri Peri sauce 11% (water, sugar, vinegar, modified starch (potato), dried vegetables (red sweet pepper, garlic, onion), natural flavouring, salt, herbs and spices (cayenne pepper, ginger), paprika extract), starch (potato, wheat, corn), egg white*, tomato paste, natural flavouring, sunflower oil, garlic, salt, sugar, colour (plain caramel), herbs and spices, barley malt extract, mineral (ferrous fumarate), vitamin B12. * free-range eggs. Produced in a facility that processes peanuts and nuts. Frying pan: 4-6 minutes on moderate heat. Turn every now and then. Oven: 10 minutes at 180°C. Turn once. Microwave: 1 minute on 900W. Barbecue or grill: Grill on both sides for 2 minutes.